It seems I spent most of the week futzing around with electronics. I had to get a new camcorder at the last minute. Also I'm in the process of upgrading our broadband. Everything should be done Monday. It was a very slow week. Only two lessons arrived. I think everyone is doing their taxes! I have taken a detour this week from how to read your work. 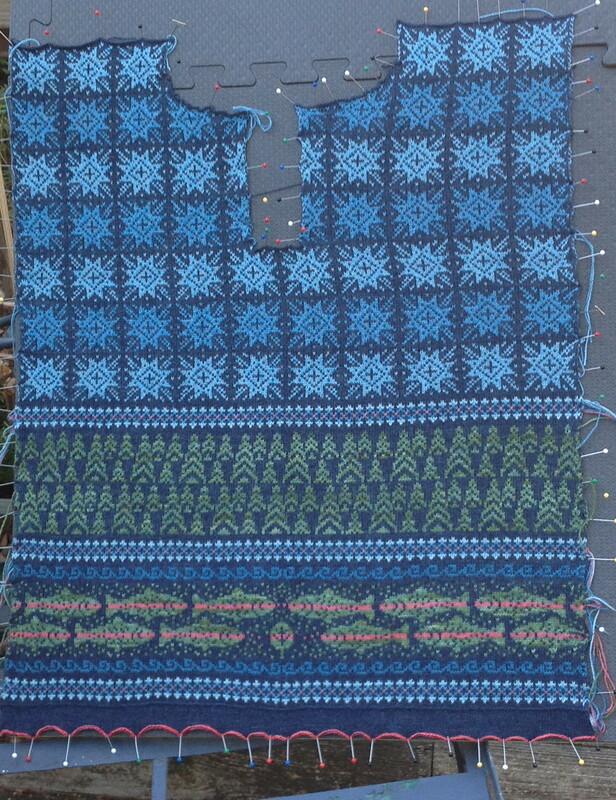 I've had quite a few people want to see how I do stranded work and since I have a stranded project on my needles I thought now would be a good time. First of all, let me emphasize I AM NOT AN EXPERT in stranded knitting. I am well aware I have some idiosyncratic methods. First of all I don't do steeks. I rarely do stranded work in the round unless the project is a hat or socks. However, my stranded work is very nice, if I do say so myself so I do have some tips which others may find useful. For traditional stranded work, you are only using two colors per row. I find it easier to hold one color in each hand. When I first tried stranded knitting I did not. I would knit with one color, drop it, pick up the other color, and so on. 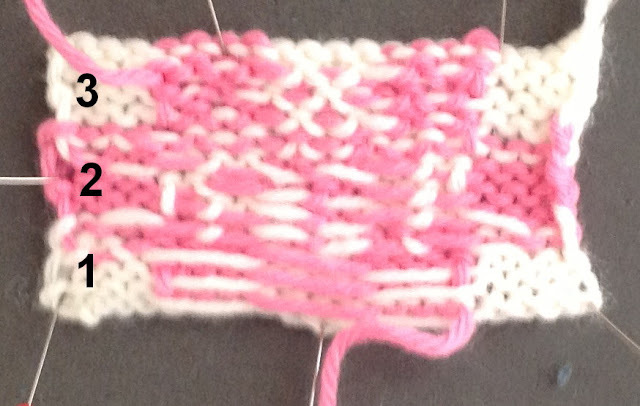 The problem with this method is that the yarn can get really tangled and it is difficult to keep one color dominant. (I'm not going to go in depth into color dominance. 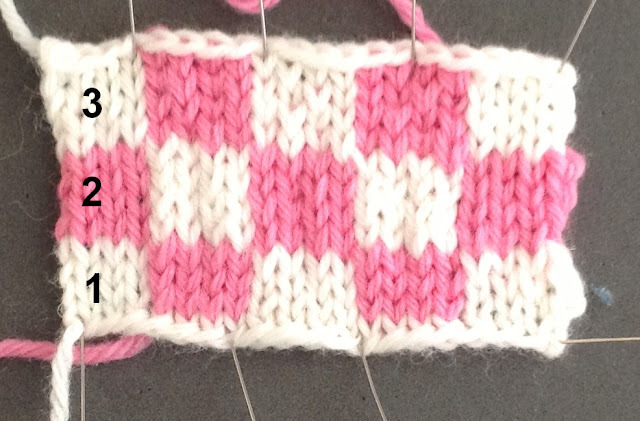 Read the Fall 2013 issue of Cast On--the Stitch Anatomy Lesson is about Fair Isle Knitting. Take a class at a conference.) In simple terms the stitches you form with the left hand are a bit more visible on the RS. For the project I am currently working on, I hold the background color in my right hand and the motif color in the left since I want those stitches to "pop". I keep the strands for the background color on top. I show how to do this in the videos. If you do not do this, your motifs may be a bit muddled. It also makes the WS look very nice. The goal with any stranded knitting is to have uniform strands. If you strand too tightly, the RS will be puckered and stitches will disappear. If you strand too loosely, you will have overlarge stitches. 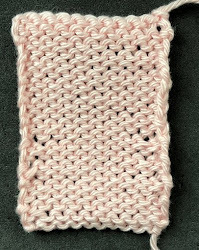 The best advice I can give is that when you are ready to work stitches with the new color, slightly stretch the stitches on the needle before working the first stitch. Periodically check the stranding on the WS of the work. 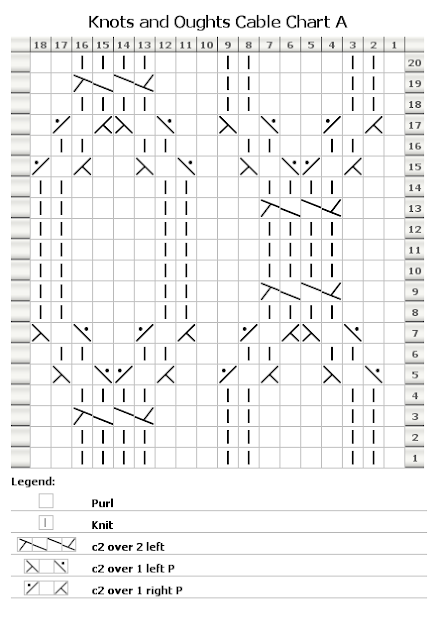 In the example, notice that the stitches are a uniform size. I take a lot of flak since I do stranded work flat. There is a reason for this. I have found when I strand in the round, I really have to work at keeping my strands from shortening. Part of this has to do with the tubular nature of circular work. When I work flat, I am forced to see the WS. Working flat means that you have to purl (THE HORROR, THE HORROR, to quote Conrad) and that you may have to read some charts from left to right. I don't find this that big of a deal. Would I recommend that everyone do stranded work flat? Absolutely not! It just works for me. I did do two videos this week...one with stranding on the RS and the other with stranding on the WS. Hopefully upgrading my broadband will make uploading videos more pleasant. One thing I NEVER do when stranding is "catching" the strand. One of the pitfalls of stranded knitting is that the strands can snag. For that reason, you don't want to have long strands. When I design a chart, I just make sure that I don't have strands longer than an inch. 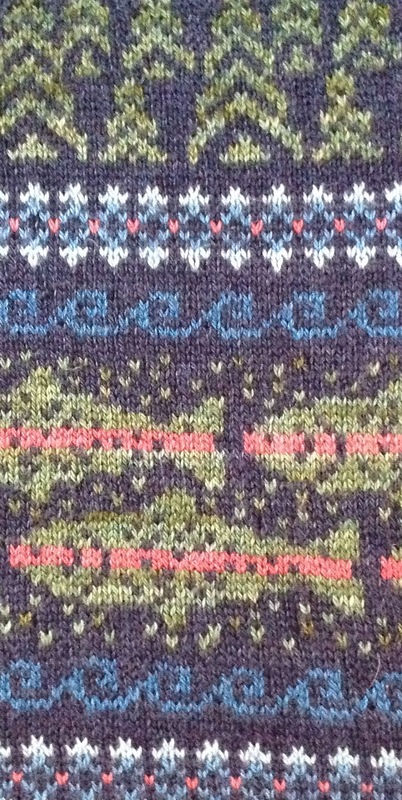 For the sweater I am currently working on, I don't have strands over more than 8 stitches. If you look at the fish in the design above you'll see some little dots of green around the fish. I placed those stitches so that my strands aren't too long. This is something I am picky about as I feel the "catches" disrupt the fabric on the RS. Next week I will go back to how to read your work. I'll discuss simple lace patterns. Salon will be on Saturday from 1:30-3:20. No operas, no basketball games (sniff!) so Saturday it is. 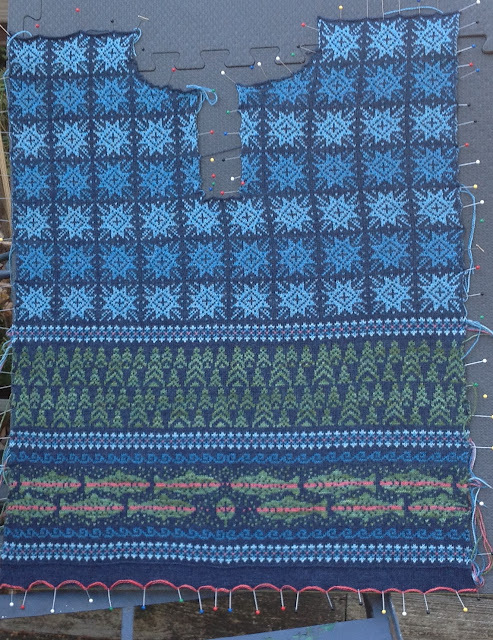 I've finished the sweater front and now am working on the sleeves. All of the yarn for my other projects has arrived so there will be no lag once I finish. I did get some more of the blues for the stars as it looked like I was running out. The sleeves will only have stars and a border at the cuff. I've also ordered clasps for the front opening. I've learned that it can take quite a while!